Lovely all brick, golf view home in private cul-de-sac setting of Pinehurst #6! 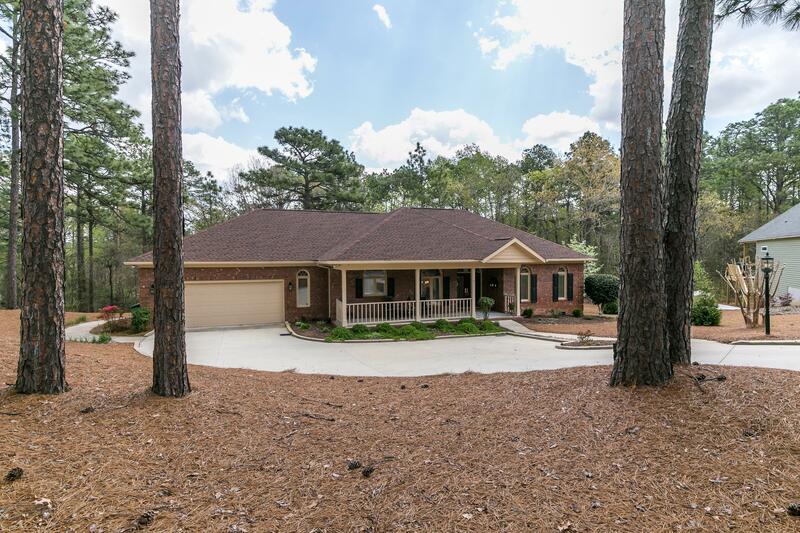 Single level home with spacious layout, split bedrooms, and spectacular views of the 16th hole of Pinehurst CC's #6 course. This over-sized lot backs up to a 7 acre wooded parcel which provides a very private backyard setting! Hardwood floors throughout, high ceilings, updated kitchen and baths. Plantation shutters, new light and plumbing fixtures and many more updates! Living room features gas fireplace. Formal Dining. Eat-in kitchen with granite, tile backsplash. 2 car garage PLUS golf cart bay/workshop. Plenty of storage throughout home. Rear composite deck spans entire back of home and offers beautiful views. Laundry plumbed for sink. Roof approx 5 yrs old, Carrier heat pump w/wireless thermostat new 2017.